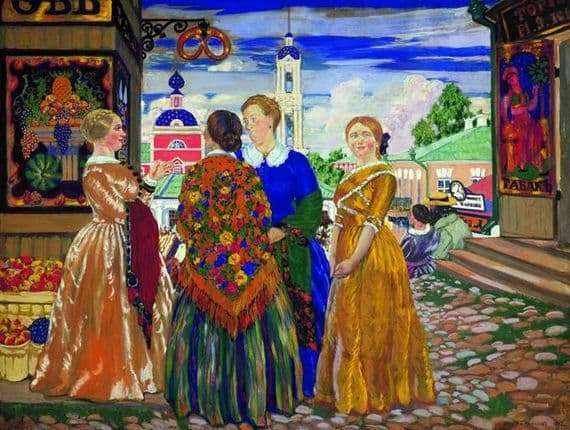 Kustodiev addressed the image of simple women more than once. As if by a magnet, he was attracted by enterprising women breathing health. Therefore, in the artist’s collection there are a decent number of paintings on this topic. Among the entire array of canvases, the painting “Kupchikhi” stands out in a qualitative way, where Kustodiyev tried to convey the atmosphere of the medieval market. The canvas appeared in 1912 and immediately received a positive assessment of society. In the center of the picture are four magnificent ladies and talking about something. It seems that they solve some important questions or discuss something. And one of them, the one who is in a yellow dress, demonstrates her disinterest in a conversation – her attention is attracted by a kind fellow, who stands somewhere far away. The smile of the coquette is clearly seen on the face of the young girl. Three women, obviously older, discuss important matters. Their attire and hairstyle indicate that they have long been married. It is worth noting that the artist exactly tried to convey the fashion of those times and by the picture you can set the century about which Kustodiyev tells. In the background, the artist did not miss a single detail. The picture harmoniously combines various dishes, passers-by, and even in a ridiculous way a hanging clock in the window of one of the stores. Even such an imperceptible element as grass, sprouted through a stone road, did not hide from the artist’s gaze. The canvas carries a connoisseur of art in the era of the Middle Ages, to famous fairs that gathered in big cities – in Kharkov, Novgorod and Kiev. The picture is simply imbued with the spirit of this era. A separate praise to the artist should be said for the skillful use of paints, each element complements the other and forms a complete picture. In short, not a picture, but a sight for sore eyes.